Join the Jazz Arts Group in the annual “One Night Only” event this Fall, Friday November 1st at the Lincoln Theatre. The historic Lincoln Theatre will be in full- swing with the remarkable Bobby Floyd Trio in the ballroom, andColumbus Youth Jazz members led by Mark Donavan in the Jazz Academy. Then the main stage spotlight shines bright on a star-studded group led by trumpet virtuoso Byron Stripling, featuring Bobby Floyd, Dave Powers, Reggie Jackson, and a special return appearance by Broadway’s Chester Gregory lending his incredible vocals to the bill. Finally, One Night Only dances into the night with a soulful after-party featuring the Dan White Sextet in the ballroom as the Jazz Academy transforms into an intimate jazz club starringWonder Twin Powers to cap off the night. One Night Only showcases some of Columbus’ brightest talent performing distinctly American styles, all to support the mission of the Jazz Arts Group. Please join us for this night to remember! 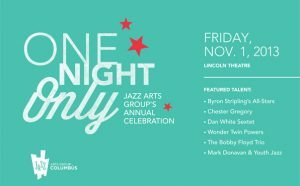 One Night Only showcases some of Columbus’ brightest talent performing distinctly American styles, all to support the mission of the Jazz Arts Group. Click here to make your reservations!